Is this ONVIF compliant, to work with other manufacturers? Yes, you can setup your camera via port forwarding. Although, this setup is recommended for more advanced users. You will need to note the IP Address of the NVR/DVR. To obtain this you’ll need to download and run our SADP program, you can download it here(Make sure to disable any anti-virus or malware protection software before SADP installation): http://www.laviewsecurity.com/files/software/sadptool_v3.0.0.2build20150911.exe. 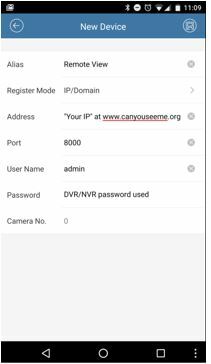 Use the IPv4 Address to log into your camera via web browser on a PC. Once you can log into your camera we know the IP address is working properly. Then you’ll need to log into your router via web browser on a PC. Once logged in, you’ll need to add ports 80, 8000, and 554 to the port forwarding rules. For help with port forwarding for your router, contact the manufacturer or your ISP. There are also guides for a lot of various models of routers here https://portforward.com. DVR3 554 554 TCP 192.168.x.x.